The Gamebone is an external gamepad for the iPhone platform that hopes to add buttons (and therefore gaming cred) to the buttonless devices, but we're just not confident it's been fully thought through. First of all, games would have to be compatible with the controller, and given that so many games are dependent on the accelerometer (hell, the "looka that!" sensation of the accelerometer is the driving force behind a ton of these games), the Gamebone wouldn't work with a lot of the most popular games in the App Store. 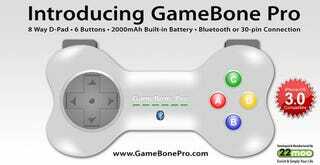 Plus, the Gamebone doesn't physically attach to the iPhone itself; it probably connects via Bluetooth. The makers say they'll supply a vertical and horizontal stand for the iPhone, but that's still sort of awkward for what's supposed to be a handheld device.